A complete step by step tutorial on Vibration Sensor Library for Proteus. Hello friends, I hope you all are fine and having fun with your lives. Today, I am going to share a new Proteus Library named as Vibration Sensor Library for Proteus. This Library is designed by our team on TEP and its not yet published anywhere. We are the first creator of this Vibration Sensor Library for Proteus. This Library contains just one Vibration Sensor named as SW-420. 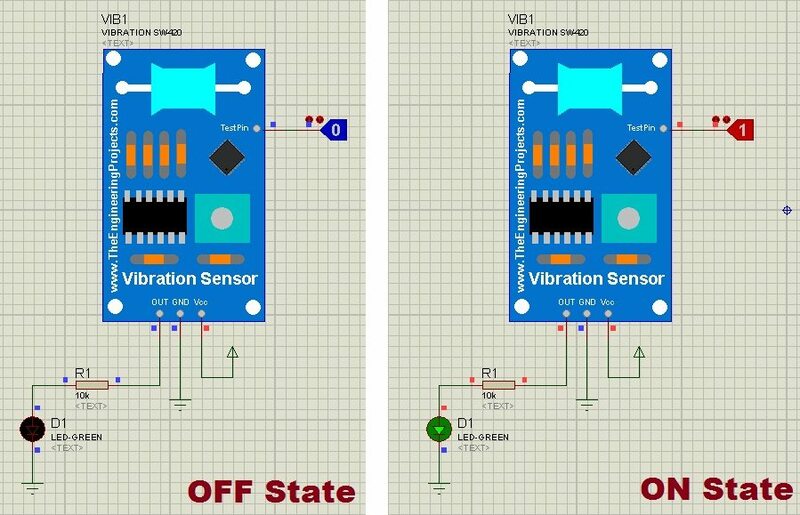 I will post a tutorial soon on interfacing of this SW-420 Vibration Sensor with Arduino. This library is compatible with all the microcontrollers like Arduino, PIC Microcontroller or 8051 Microcontroller etc. Place all these three files in the Library folder of Proteus software. If you are new to Proteus 7 Professional, then you should have a look at How to add new Library for Proteus 8 Professional. Noe restart your Proteus software if its already open. 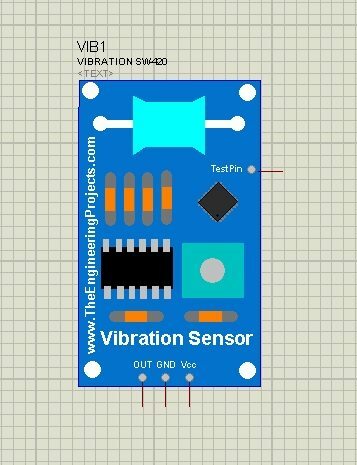 In the components search box, you have to search for Vibration Sensor, and you will get Vibration Sensor SW-420. First one is Vcc so apply +5V here. Second Pin is GND so apply ground here. Third Pin is OUT, its the output pin from where you get whether there’s vibration or not. Fourth Pin is TestPin and if its HIGH then it means you have vibration and the OUT PIn will go HIGH and if its LOW then it means there’s no vibration and OUT Pin will also be LOW. Now last thing you need to do is to double click this sensor to open its Properties. In the properties, you will find a Program File, in this section browse to your file VibrationSensorTEP.HEX which we just downloaded and placed in the Library folder of Proteus software. 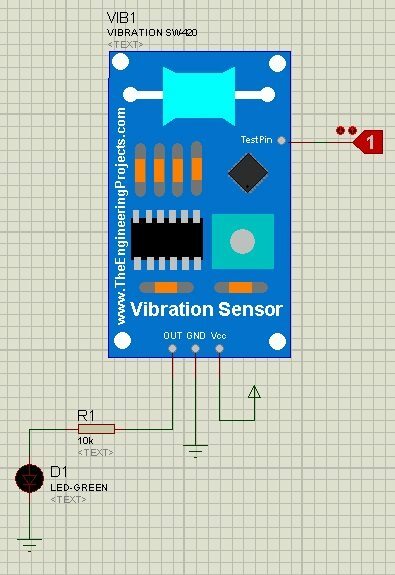 Once uploaded now you can use your Vibration Sensor in Proteus, the hex file is adding the functionality in this Vibration Sensor. Now let’s design a simple example to get an idea how this sensor works. In order to check the output voltage response how to give slow vibrations? What is the sensitivity of vibration when we are giving 1? Your team is awesome. Excellent hard work. I have download all of your libraries as they are extremely helpful to me. But there is one problem in this library for vibration sensor. It does not have the hex file for vibration sensor and the hex file is for PIR sensor. Thanks for this articles, are very usefuly for the beginners. keep on it! How to I get the library for SG3524?? ?